Flagstaff Academy is hosting a state-wide VEX IQ Robotics tournament, Saturday, February 9, 2019. Thirty-five teams from across the state, including five Flagstaff Academy elementary and middle school teams will compete. At the Saturday, February 2nd Erie Tigers VEX IQ Challenge held at Erie Middle School, Flagstaff Academy teams took top honors and three out of the five teams have qualified for the Colorado State tournament on March 2, 2019. 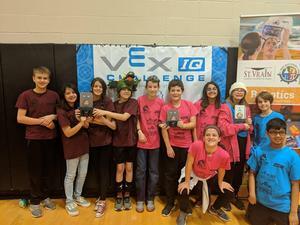 Two Flagstaff Academy teams won the Excellence Award, the highest award at a vex tournament. The excellence award recognizes the team that exemplifies overall excellence in creating a high quality VEX IQ robotics program, as well as dedication, devotion, hard work, and teamwork. This elementary team includes students Graham Bernstein, Zayan Alam, and Reese Watson; it is their second time winning this award. The middle school team includes students Levi Hughes, Olivia DeRose, Alison Kraut, and Oliver Neves. One Flagstaff Academy middle school won the Amaze Award, presented to a team that has built an amazing, high-scoring robot that demonstrates quality, a solid mechanical design, with consistently effective and successful programming. The team included students James O'Hara, Grace DeRose, Max Herrera, and Eliza Navulur, who also won an Excellence Award at a previous tournament. The February 9th tournament at Flagstaff Academy has a number of community and business partners, including Vex IQ Robotics, Creative Learning Systems, Robot Mesh, LGS Innovation, Flagstaff Academy PTO, Robotics Innovation Center of St. Vrain Valley Schools, Sticker Giant, Leading Edge Atmospherics, Flagstaff Academy Dragon Flight/Summer Camps, Voyager Sopris Learning, and LEft Hand Robotics.